Developer Assistant from Dracoventions is a FileMaker plug-in that helps FileMaker developers to save time and be more productive. This tool will make your optimization process even more efficient. 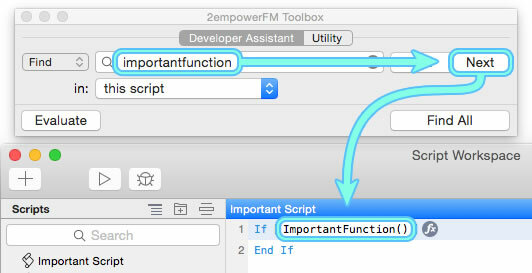 Developer Assistant lets you search all scripts, the table relationships graph, in table and field metadata, evaluate calculations in the script editor, and much more. You can easily use Developer Assistant to quickly find every instance of 24U FM Bench Detective measuring code by simply searching for the string “FMBench_” because all the custom functions from FM Bench Detective begin with this prefix. You can even use regular expressions for more complex searches, or instantly evaluate any selected text using the FileMaker Pro calculation engine. Click here to learn more about Developer Assistant.